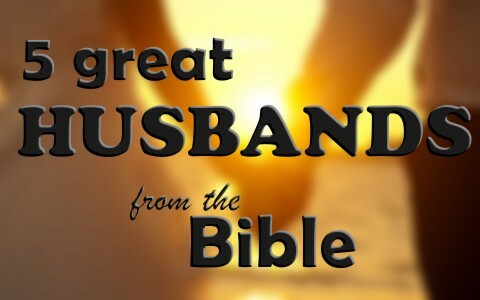 Here are five great husbands and their attributes that we find listed in the Bible. What made Abraham such a great husband, although far from perfect, was his obedience to God. When God commanded Abraham (then Abram) to “Go from your country and your kindred and your father’s house to the land that I will show you” (Gen 12:1), Abraham didn’t stop to think about it, he didn’t question God about the location, and he didn’t ask anyone else’s opinion; it simply says “So Abram went, as the Lord had told him, and Lot went with him” (Gen 12:4a), period! Why did this make Abraham such a great husband? If a husband loves God to the same extent that Abraham loved God by obeying Him, then you would expect that Abraham was a great husband. There is no biblical record that Abraham ever spoke harshly about or to Sarah. The Bible informs us that “the man Moses was very meek, more than all people who were on the face of the earth” (Num 12:3) so it’s somewhat surprising that “Miriam and Aaron spoke against Moses because of the Cushite woman whom he had married, for he had married a Cushite woman” (Num 12:1) but it’s always a very bad idea to speak evil about someone and confront a person who God has placed in a position of leadership in the church. Whoever opposes God’s appointed leader literally opposes God. When Miriam and Aaron said “Has the Lord indeed spoken only through Moses? Has he not spoken through us also?” And the Lord heard it” (Num 12:2), they were saying, “Hey, what about us? We’re the leaders too.” When the Lord heard it, you can be sure that God was angry (Num 12:9). When God brought His righteous judgment upon Miriam and Aaron, “When the cloud removed from over the tent, behold, Miriam was leprous, like snow. And Aaron turned toward Miriam, and behold, she was leprous” (Num 12:10) but when Aaron pleaded with Moses (Num 12:11) Moses stepped in as a mediator and prayed “O God, please heal her—please.” But the Lord said to Moses, “If her father had but spit in her face, should she not be shamed seven days? Let her be shut outside the camp seven days, and after that she may be brought in again” (Num 12:13-14). Since Miriam was punished and Aaron wasn’t, this seems to show that Miriam was behind this rebellion and especially knowing that Miriam is always mentioned ahead of Aaron in these verses. Why would this make Moses a great husband? It was because Moses was a mediator for his sister and he prayed for her and there is no biblical evidence that he ever held it against her. Joseph must sure be considered a good husband. We know that he was a carpenter and so he supported his family. He was also most like a godly man (Matt 1:19). He also was very understanding, although not in the beginning, in referring to Mary conceiving by the Holy Spirit and being with child (Jesus). Among the Jews, especially the religious leaders, it was scandalous. Joseph and Mary were betrothed to one another and in their culture, it was as legally binding as being legally married is today. When Joseph found out Mary was pregnant and knowing it wasn’t his, and “being a just man and unwilling to put her to shame, resolved to divorce her quietly” (Matt 1:19). He could have responded in anger or fly into an outrage as most husbands might have done. He might have confronted Mary but thankfully, God sent an angel of the Lord which told “Joseph, son of David, do not fear to take Mary as your wife, for that which is conceived in her is from the Holy Spirit. She will bear a son, and you shall call his name Jesus, for he will save his people from their sins” (Matt 1:20-21). Joseph was patient and understanding with Mary and for good reason. That would make him a great husband. Who could have been more generous than to accept and marry a Moabite woman than Boaz? Boaz was a very generous man too as well as a godly man (Ruth 2:1, 4). Ruth and Naomi went out to glean in the fields what the harvesters left over (Ruth 2:2) and Boaz told Ruth “Now, listen, my daughter, do not go to glean in another field or leave this one, but keep close to my young women. Let your eyes be on the field that they are reaping, and go after them. Have I not charged the young men not to touch you? And when you are thirsty, go to the vessels and drink what the young men have drawn” (Ruth 2:8-9). Boaz was not only a great provider, he was very protective of Ruth (Ruth 2:9) and would later marry Ruth and they would have a child. These two became part of the royal lineage as recorded by Matthew who wrote, “and Boaz the father of Obed by Ruth, and Obed the father of Jesse, and Jesse the father of David the king” (Matt 1:5-6a). Boaz was arguably one of the greatest husbands in the Bible. Most think of Jacob in negative terms and early on, they have good reason too. Jacob’s name means “supplanter,” almost like “trickster” but Jacob’s name would later be changed to Israel. To prove that Jacob was such a diligent worker, he worked seven years for what he thought was the right to marry the woman he loved, Rachel, but Laban tricked Jacob into working seven years for him, only to marry him to his other daughter, Leah. Jacob could have left right then and there but he loved Rachel more than Leah and so worked another seven years to secure his bride (Gen 29:30). If Jacob had not been hardworking, dependable, and diligent enough to work for 14 years, he probably wouldn’t have made a very good husband but his determination shows that he was a good provider for his family and made Rachel and Leah a good husband. I think the reason that Miriam was listed ahead of Aaron in their rebellion against Moses was because she was the one behind the rebellion. Remember how Aaron caved into the social pressure of Israel to make a golden calf when Moses was with God on Mount Sinai? I can see this happening today in marriages. When men get together we should always speak highly about our wives or not speak at all. A great husband just doesn’t happen naturally. It takes an obedient heart toward God like Abraham had, it takes a forgiving heart like Moses had, it takes an understanding heart like Joseph had, it takes a generous heart like Boaz had and it takes a diligent heart like Jacob had. Did i miss something? Mariam is Moses’s sister not his wife. Not to say it was good for Moses to pray for Mariam. Previous post: Who Was Nimrod In The Bible? Was He Good Or Evil?